Fondo Network is a centralized Coins Exchange that enables investors to trade Cryptocurrencies in safety, quickly, security and low-cost. And also we promise to protect our clients asset and information. Investors can trade top Cryptocurrency safely, quickly, and cost-effectively. Access to all potential projects still in the ICO phase. Easy asset management with professional trading interfaces and scientific asset management interface. Other than using Fondo Network's ICO Market as a channel for capital raising. 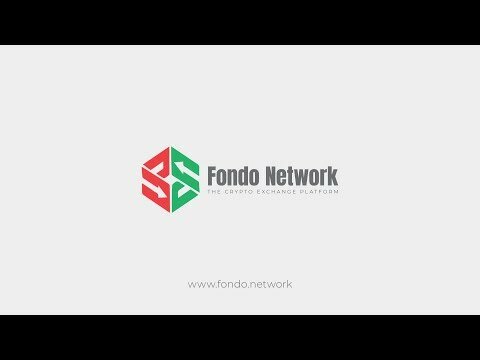 All functions for the token sale process of the project will be prepared by Fondo Network. It will be easier for project owners who want to raise funds by selling their Tokens. Fondo Network builds a smart, multi-Cryptocurrency Exchange that is fast and maximizes profits for investors when processing transactions on Fondo Network platform. In addition, the top security of the Fondo Network will provide clients a safe, reliable experience, as well as ensuring the transaction. With the visionary ability and true purpose, Fondo Network will become the world's top leading Exchange. Fondo Network Exchange is one of the first and most prominent services in the Cryptocurrency market. All the trading of Crytocurrency are made through Fondo Network Exchange. Infact, Fondo Network Exchange provides users all services of purchase and sale of the Coins and othe rCryptocurrency assets. Fondo Network Exchange is a leading Exchange platform for Cryptocurrency. Fondo Network Exchange have all the functions that a basic Exchange that help the purchase and sale service, andother Cryptocurrency assets become quickest, safest and at th elowest cost. Beside the Cryptocurrency traded on the market, Fondo Network Exchange also lists new Tokens. These are potential tokens, practica lapplications with huge communities. These Tokens have been appraised by many experts and their development will be great in the future. But at the present, many projects are difficult to reach new customers in the market. Developing FDC Nework Beta version. Fondo Network Exchange will be listed in top 3 Exchanges which has crowded users in the world.